I am Lady of the Leftovers. Baronness of the By-Product. Countess of Casserolling. Duchess of the dodgy looking bag of carrots in the back of the fridge. Butternut squash seeds? I&apos;ll spice and toast them. Scraps of pastry? Blatantly going to be re-rolled into cheese straws. Potato peelings? Tossed in olive oil and baked into crisps. My stock pot bubbleth over. Bread to breadcrumbs. Wrinkly apple to crumble. The leftover damsons from my Christmas Damson Gin are within my realm and they shall too be given a royal send off. 1, Make the damson purée first by adding the damsons and sugar into a medium sized saucepan and simmering with a splash of water. Smoosh the damsons down with the back of a wooden spoon. 2, You need to simmer this until the damsons have broken down completely and have formed a light jam like consistency. Dependent on your damsons, you might have to add in more water. 3, Pass the cooked damsons through a sieve. I had around 115gr of thick purée at this point. Leave this to go completely cold. 4, Make the custard base of the ice cream by beating the eggs, sugar, corn flour and vanilla extract together in a large heatproof bowl. 5, Bring the milk and 150ml of the double cream to just below simmering point and pour slowly onto the beaten egg etc using a whisk to combine. 6, Pour back into the saucepan and set over a low heat. Stir continuously until the custard has thickened and you get a nice thick covering on the back of a wooden spoon. Do not allow to boil as this will give you lumps. 7, Remove from the heat and allow to cool slightly. Pour in the rest of the double cream and stir through the cold fruit purée. Let this go completely cold before churning in an ice cream machine. 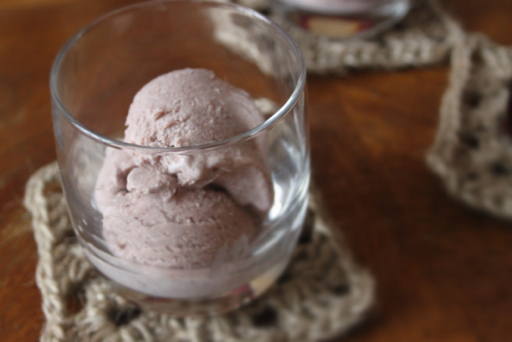 8, Spoon the churned ice cream into freezer proof container and freeze. 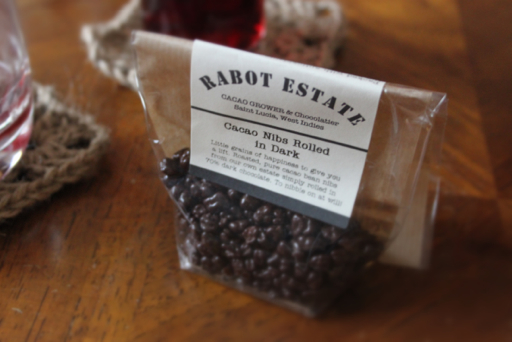 Serve plain or with a splash of damson gin and chocolate covered cocoa nibs. 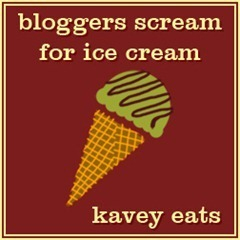 I&apos;m entering this into Bloggers Scream For Ice Cream, a monthly frosty treat challenge from Kavey of Kavey Eats. To celebrate one year of the challenge, all previous categories have been opened up. 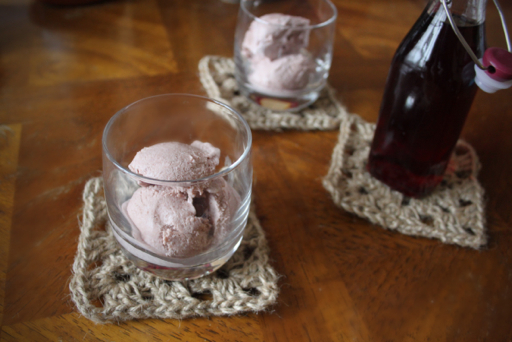 My damson gin ice cream fits the categories of custard based, fruit and booze! I always struggle with the problem of what to do with the damsons or sloes from my decanted gin or vodka. This sounds lovely - even on a cold night like tonight. 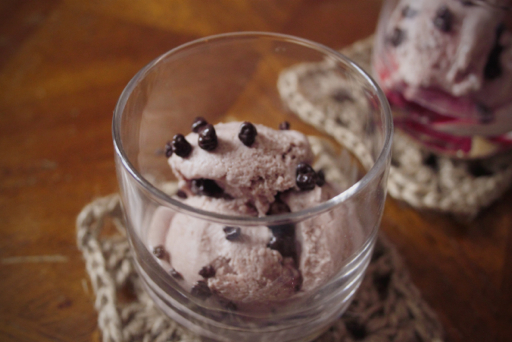 that is the prettiest ice cream with the BEST ingredients! I agree with the previous comment - such a beautiful hue! Thank you Katharine, I love the delicate colour of this, especially as the damson gin itself is a deep red! a most glamourous use of leftovers! Thank you :) I agree on the glamour! 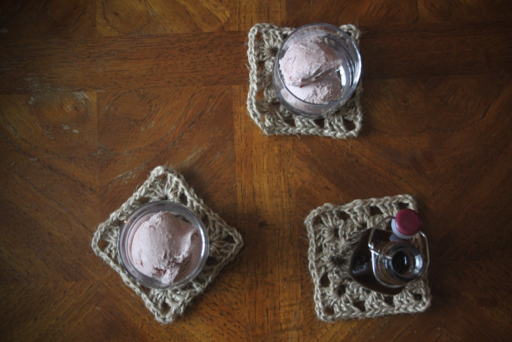 Oh, I pay homage to Lady of the Leftovers and would be happy to consume your Damson Gin ice-cream at any time. I was wondering how on earth you were going to get rid of the Damson stones, but it sounds so obvious now you've mentioned "sieve" - doh! 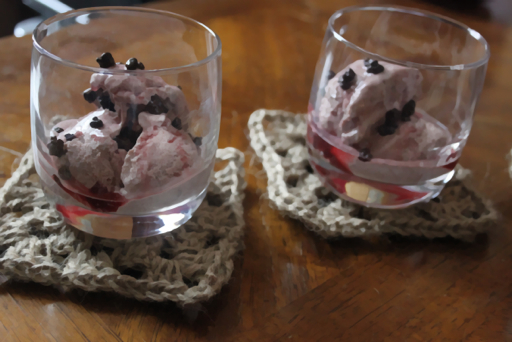 Thank you Choclette :) It is a lovely ice cream, would be perfect with other fruit too. Stoneless ones preferably, y'know to cut down on labour times. Love that you've nailed three categories in one ice cream. It looks delicious! 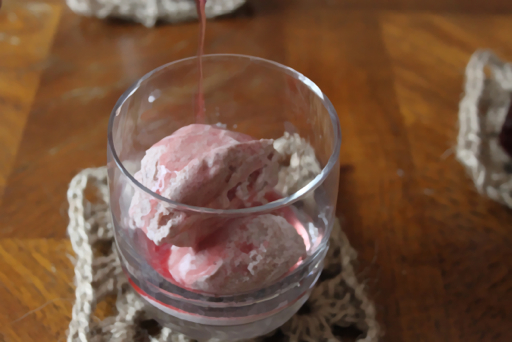 When I made strawberry vodka we didn't waste those vodka-soaked beauties either, though I confess I was so impatient we ate them before they made it into any ice cream! Thank you Kavey :) I think vodka soaked strawberries would have bypassed the kitchen and gone straight into my mouth too, love the idea of strawberry vodka! I love a leftover! This is magnificent. Thanks for nice sharing. You can also find best Iron and steel material at Laxmi Iron & Steel Industry. The main object of LAXMI IRON & STEEL INDUSTRIES is to provide best quality and cost effective Cast Iron & Steel. For more information about Cast Iron Casting manufacturer & Cast Iron lift weight Visit LaxmiInd.Com Today. I've ended up with 1450 gr of thick puree!!! I don't want to make that much icecream, can I double the puree amount, what do you think?